Hello friends of Really Reasonable Ribbon! It's me, Karen Letchworth, sharing today's post with this sweet little paper mache house that I painted with cream paint, covered in vintage sheet music, glitter-covered vintage buttons, and several FABULOUS products from Really Reasonable Ribbon. The first trim I added was the sweet Debra Natural Crochet Lace that I ran all the way around the top of the house base and also at the top of the door frame. 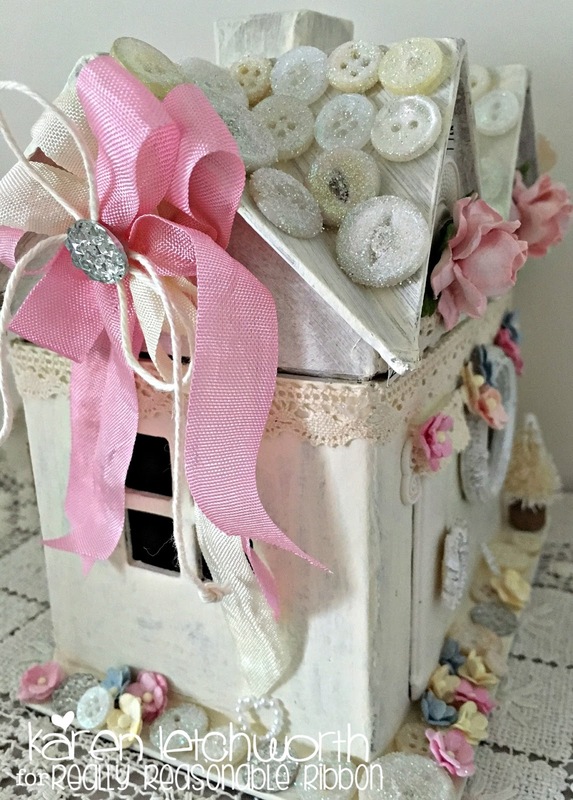 I also added some Pink Trellis Roses to the peaks of the roof from the Trellis Roses Mixed Pinks Collection. 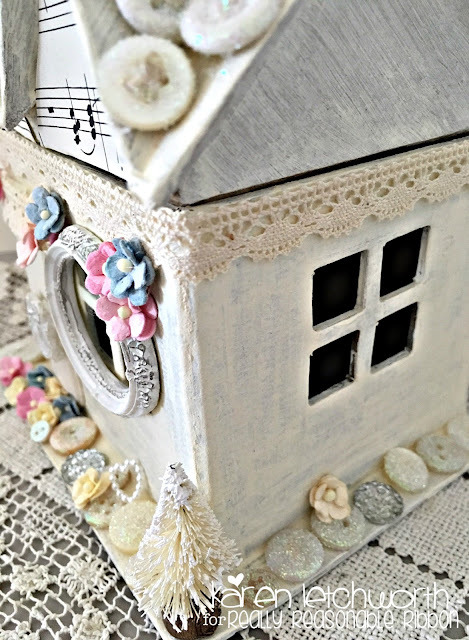 All along the path outside this sweet little house as well around the window, I hot glued more glittered buttons, a few Silver Rhinestones (out of stock), some 11mm White Heart-Shaped Flatback Imitation Pearl Beads, and several pink, ivory and blue Miniature Sweetheart Blossoms. They all look so sweet along the garden path. 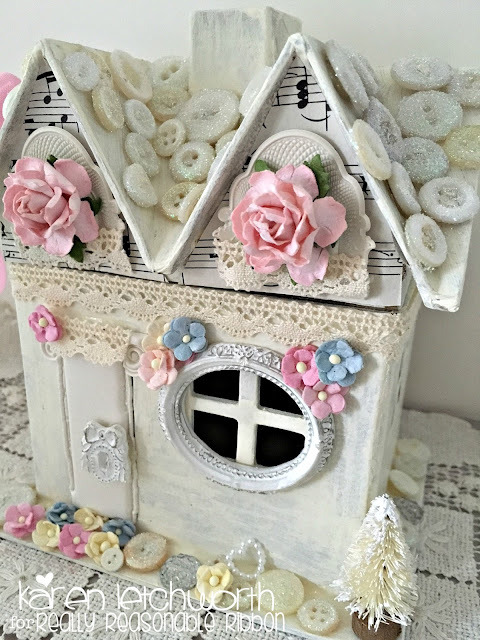 On the side of the roof, I added a big bow using lengths of both Cream Seam Binding, Pink Aster Seam Binding and Solid Natural Baker's Twine. There's just something SO soft and lovely about Seam Binding bows, and Really Reasonable Ribbon offers you 43 colors at just $1.50 for a 5-yard length. You will never regret buying Really Reasonable Ribbon's Seam Binding....it's GORGEOUS!! I love how easy it was to decorate my paper mache house using simple supplies to cover it, and then decorating it with my Really Reasonable Ribbon trims, flowers, and Embellishments. I love how it turned out, and I'd be happy to answer any questions you might have. Thanks for stopping by to take a look. 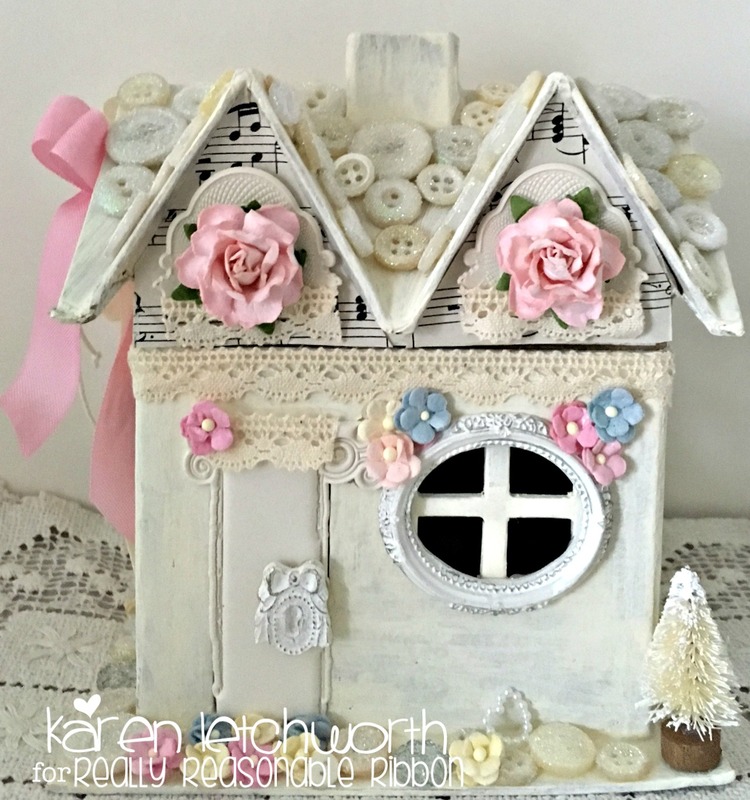 Don't forget about the FUN CHALLENGE taking place now on the RRR Blog. We love having you play along with us. 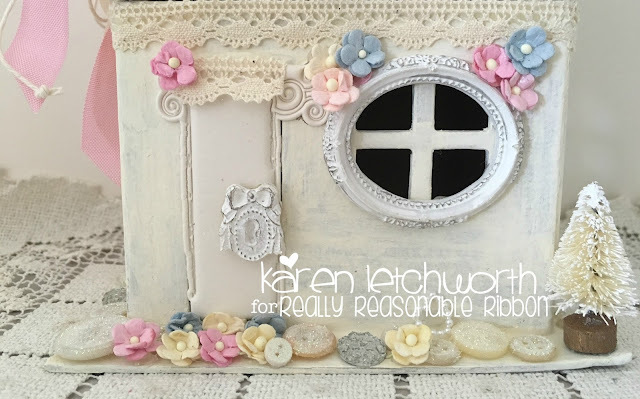 Really Reasonable Ribbon wants to be your number once source for all ribbons, trims and more. You can view ALL the fabulous products available here at Really Reasonable Ribbon. We're so grateful for your visit. We hope you will take time to do some shopping at Really Reasonable Ribbon to see what you might want to help you create something special. They have it ALL!